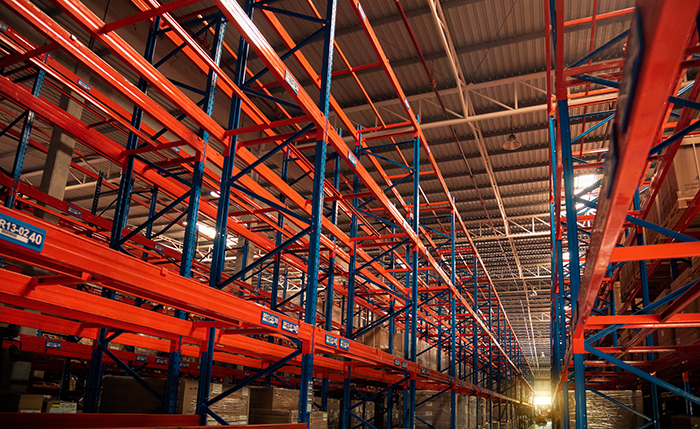 New warehousing capacity can not come online fast enough in Southern California. Photo credit: Shutterstock.com. The front-loading of spring merchandise in November and December to avoid threatened tariffs on Chinese imports has made the Los Angeles-Long Beach port complex a virtual warehouse, highlighting how industrial space pressures will only rise this year. The recent development raises the concern that even though new distribution capacity nationwide in 2018 exceeded absorption for the first time in eight years, logistics space in the two largest gateways of Los Angeles-Long Beach and New York-New Jersey may be operating now at maximum utilization. Two developments are driving this trend, increasing imports and double-digit growth in online shopping. Vacancy rates for logistics space nationwide remained at a record low 4.8 percent at the end of 2018. US containerized imports in the trans-Pacific increased 8.3 percent last year, according to Alphaliner, forcing warehouse rents higher and absorption to increase in most US markets. However, it appears that Southern California and northern New Jersey bore the brunt of front-loaded spring merchandise in late 2018, causing unparalleled congestion in those markets. The unexpected spike in imports that would have normally arrived in early 2019 if it were not for the threat of 25 percent tariffs on more than $200 billion of imports from China was a one-off event, but the North American supply chain can be disrupted by weather events, such as the polar vortex that has descended upon the nation’s midsection or flooding, hurricanes, and tornadoes that can cripple infrastructure in the interior but push congestion all the way back to the seaports. For example, a breakdown in rail service in Canada due to harsh weather in the winter of 2017-2018 caused container dwell times in Vancouver and Prince Rupert to double to six days or longer. When warehouses in Southern California began backing up last autumn, street dwell times of containers spiked to seven days, compared with the normal three to four days’ dwell, and street dwell times for chassis increased to more than seven days. However, the spike in dwell times occurred primarily in Los Angeles-Long Beach, and to a somewhat lesser degree in New York-New Jersey, but were not present in other gateways such as Seattle-Tacoma, Norfolk, and Savannah and Charleston, according to terminal operators with facilities at those ports. The import surge due to front-loading of spring merchandise was so crippling to Southern California because those imports competed for logistics space that was already tight because of the longer-term trend of retailers holding on to larger inventories to feed the insatiable appetite of consumers for online shopping in large urban areas, said Jason Tolliver, vice president and head of logistics and industrial research at Cushman & Wakefield. In the Southern California market, leasing velocity — including renewals, expansions, and new leasing — was higher than elsewhere, he said. Low vacancy rates, high absorption rates, and rising rents are expected to continue into 2019-2020, according to Cushman & Wakefield’s 2019 North American Industrial Outlook. This will be the case even though 2018 was the first year over the past eight years in which new supply coming into the US market finally outpaced demand. Cushman & Wakefield projected that in 2019-2020 about 494.7 million square feet of industrial space will be absorbed, while 548.7 million square feet of new supply will be delivered. Asking rents nationwide are projected to increase to an average of $6.68 per square foot by the end of 2020, although based on current rents in Southern California and New Jersey, rents will be much higher in those markets. By comparison to the national vacancy rate of 4.8 percent and asking rent of $6.14 per square foot, Los Angeles in the fourth quarter had a vacancy rate of 1.5 percent and $10.43 per square-foot asking rent. Other comparables in the two largest gateways were: Orange County, 1.8 percent and $11.06; Inland Empire, 3.8 percent and $8.07; northern New Jersey, 4 percent and $8.65; and central New Jersey, 2.6 percent and $8.24. As rental rates in Southern California climb higher and faster, some importers are calling it quits. A third-party logistics provider (3PL) said last autumn he pulled his warehousing operations out of Southern California, where he was paying 30-40 percent higher rents than in the Southeast. However, the front-loading of spring merchandise highlighted another reality of the Southern California marketplace, which is that many retailers have no choice but to pay the higher rents and storage rates that are charged in the region rather than shift merchandise to other gateways because of the transloading advantages the gateway offers. Los Angeles-Long Beach is the largest US port complex, handling more than 17.5 million loaded and empty TEU, according to port statistics. This critical mass of container volume creates a large local population. Also, the opportunity for delayed fulfillment — holding on to merchandise later in the supply chain before shipping it to the Northeast, Midwest, or Southeast based on seasonal demand, weather trends, and other factors that affect consumption — makes Southern California a logical entry point for imports from Asia. “Los Angeles-Long Beach … is the transloading capital of the country, with the double advantage of being the second largest US population center and having the most extensive intermodal rail services from the West Coast,” Cushman & Wakefield stated. In past years, warehouse operators in the Southern California gateway, with more than 1.5 billion square feet of industrial space, were able to maintain fluid operations even during the peak-shipping season each autumn by maintaining excess capacity of about 10 percent. More recently though, seasonal imports have begun to clash with space devoted to e-commerce last-mile fulfillment, so the 10 percent buffer has disappeared. “Absolutely. It’s a one-two punch,” Tolliver said. The growth in e-commerce fulfillment has filled up the most desirable industrial properties in Southern California and is contributing to higher rents and declining availability in Class “B” and “C” properties. Most gateway cities that provide proximity to both a seaport and a large population base are generally experiencing higher-than-average absorption rates and rising rents, “especially on the West Coast,” Tolliver said. In the west, the average vacancy in the fourth quarter of 2018 was 3.5 percent and the average asking rent was $8.79. Cushman & Wakefield stated that rent growth in coastal cities was more than double the overall US average growth. “Among the top-performing US markets in 2018 were San Francisco, New Jersey, Seattle, Central Valley California, Sacramento, Boston, Memphis, Oakland/East Bay, Hampton Roads, Raleigh/Durham, Los Angeles, Orange County, Austin and Atlanta,” the report said. When there is little land available for industrial development and rents increase to a point where they can support costlier logistics space, the solution may be to build up, Tolliver said. Prologis has developed a three-story distribution warehouse at the Port of Seattle, and other markets where developers are looking include the San Francisco Bay area, Los Angeles, and New York. “Where demand is really strong, in those markets going vertical makes sense,” he said. Although Cushman & Wakefield does not expect developers to build multi-story warehouses in other locations where industrial space is more readily available, it does anticipate double-digit rent growth in the major seaport and inland hub cities to continue at least through 2019. “Because of the convergence of traditional import distribution and e-commerce fulfillment, port markets, like those fed by Long Beach-Los Angeles and New York-New Jersey, and infill-sited submarkets of populated inland distribution hubs such as Dallas and chicago, is where US rent growth will be strongest,” the report stated. Contact Bill Mongelluzzo at @bill.mongelluzzo@ihsmarkit.com and follow him on Twitter: @billmongelluzzo.